Have you ever suffered from neck and/or shoulder discomfort from spending long hours day after day viewing a monitor in exactly the same position? 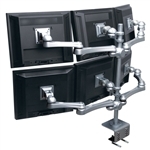 That problem is quickly solved with flexible monitor arms, which allow you to easily reposition the monitor, and allow for continual adjustment throughout the workday. You are no longer locked into one permanent viewing position. Awkward viewing angles quickly become a thing of the past, since you can reposition the monitor each time you feel the need. As an added bonus you will reclaim back working surface you had long forgotten you had. No matter what your application, be it single monitor, multiple monitor, occasional use or intensive use, you will be sure to find a solution that suits your requirements to a T, right here in this section. A monitor arm allows the monitor to be suspended over the desktop freeing up your desk space for productive use. Radial arms provide the ability for the monitor height to be adjusted in seconds with minimal pressure without the use of any tools for the ultimate in convenience and ergonomic gain. With the LCD arm in place, you will discover a dramatic gain in workspace when compared to placing the monitor and it’s bulky integrated base on the work surface. By merely exerting fingertip control, the monitor can be quickly moved anywhere within an impressive travel range. 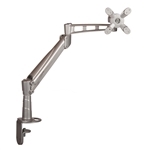 Experience the flexibility, style, convenience, comfort and ease of use of a radial monitor arm. Lateral arms present a great value to utility proposition for the computer user. 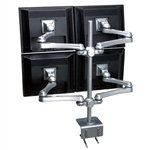 These products are based on a solid pole-mounted foundation that provides great flexibility and strength in the amount of travel that is possible as well as the number and orientation of screens that can be accommodated. In this section you will find a great many options and combinations to choose from, but please do keep in mind that just as many other potential permutations are also possible. So if you do not see exactly what you are looking for simply contact our customer service department for further information. 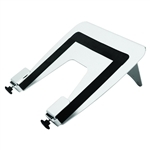 Apple users — now your iMac or Cinema Display monitor can float weightlessly above the desktop. The iLift™ saves space and allows you to work flexibly and ergonomically. Work while sitting or standing; share your monitor with a visitor; move the screen to avoid glare or to avoid neck and back pain. Simply put the monitor where you want it... no tools or knob-turning required. It’s as intuitive as your Mac! Integrate your laptop into your ergonomic workstation.